We arm creative people with creative tools. Colyer London is a single port of call for business solutions, graphic supplies and office products that support companies and inspire minds in London. Our mission is to serve the Greater London community with carefully and ethically thought out products and services, from comprehensive office and studio supplies, colour accurate printing and printers, and Mac & digital infrastructure. By working with the best manufacturers & engineers, we ensure that what you print is what you see on screen. Our London warehouse offers eco-friendly, same day delivery. Our IT engineers can manage your fleet of laptops and troubleshoot any issues, either remotely or in-house. We’re committed to being London’s most comprehensive supplier to the creative industry. Back then, we were a small, local business providing photographic copying services to legal professionals near the Law Courts. This continued for many years until World War 2 when the company suffered the same fate as many others in central London. But the post-war revival and the vital, vibrant art movement that followed saw the company back in business and stronger than ever, expanding to office stationery and the provision of graphic design materials in the heart of the City. We have continued our expansion and now lay claim to London’s only FOGRA certified print engineers as well as a wide range of multi-function printers, MAC and IT support and office catering supplies. ”You make the effort to sort things out for me, I never have to chase up. ”I find you extremely lovely people to deal with; always helpful, knowledgeable and speedy. ”You have a great response time and go to great lengths to source a product. ”I've always found Colyer London helpful, trustful and full of great advice. We are what we breathe. As a Central London business, our responsibility and so our policy is to operate as cleanly as possible. 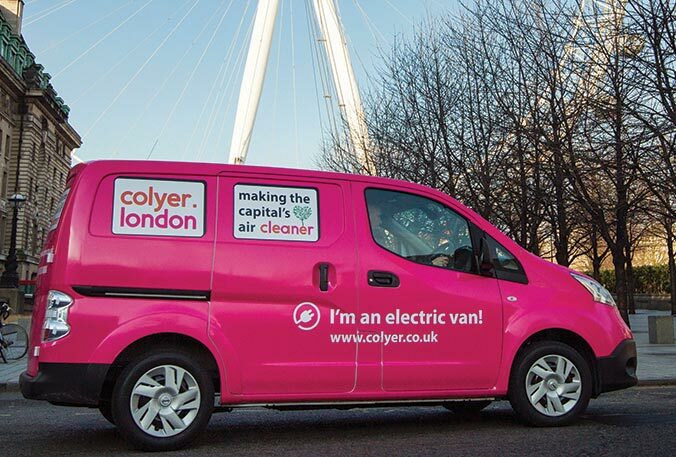 We have already introduced zero emission, fully electric vans to make our same-day deliveries and our technicians make full use of London’s public transport system to get to their appointments. Fewer cars on the road, electric or otherwise, can only be a good thing. 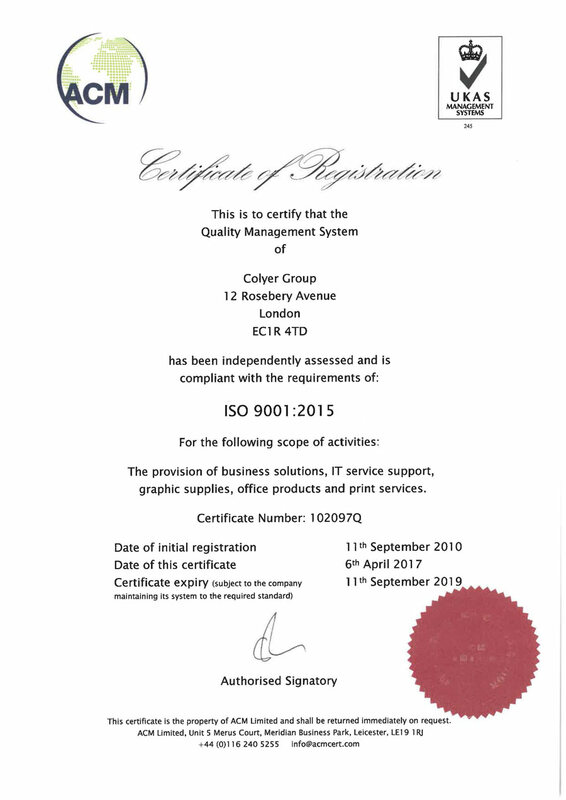 We have been ISO 14001 compliant for 8 years and we follow WEEE recycling regulations to minimize our impact on the environment (Waste Electrical and Electronic Equipment). Find out more about our sustainability practices. Our aim is to accompany our clients on a journey of discovery about their needs, their printers and their productivity with a view of improving the latter along with the bottom line. We would welcome the chance to sit down with you and see where we can help make a difference. Or if you would simply like to order some stationery, we can take care of that too. Give us a call, send us an email or fill out the form, and one of our friendly customer service staff will get back to you quickly. We know we’re good (and regularly pat ourselves on the back when we think no-one’s looking) but it’s great to have some external validation that says the same thing. 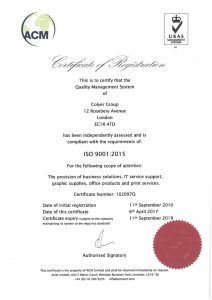 So not only do you get quality when you work with us, you get (ISO) qualified quality. And that’s not very easy to say.